This is a tasty snack or just right for party food. 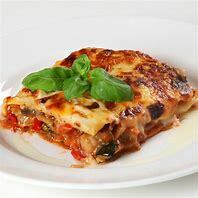 You can sprinkle bacon bits over the top or add chopped herbs for a bit of colour and extra taste. Scrub the potatoes, rinse and pat dry. 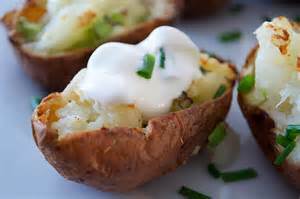 Prick the potatoes with a fork, then bake in the oven for one and a half hours until tender. Meanwhile, make the dip. Mix the soured cream with the chives and a good dash of salt and pepper and chill. Leave the potatoes to cool for a few minutes, then cut each one in half lengthways and then again to make 4 long pieces. Using a teaspoon, scoop out most of the potato, leaving just a thin layer next to the skin. 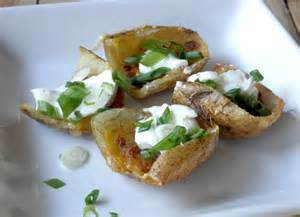 Brush the potato skins with oil, then fry over a medium heat for 5-7 minutes on each side until golden. Sprinkle with salt and then either spoon in the soured cream or dip into it.